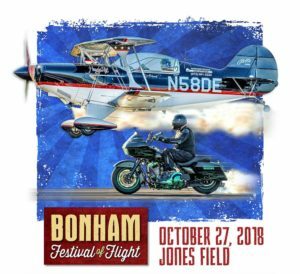 The 2018 Bonham Festival of Flight Airshow is October 27, 2018, at Jones Field in Bonham. We are very excited to be flying once again at this great show! Enjoy a cool autumn day of aviation excitement as the airshow performers thrill the crowd with precision aerobatic flying. Plus, there will be a Young Eagles Rally. Young Eagles is a program where children are given aircraft rides for free to introduce them to the thrill of aviation. If you have a child, between the ages of 8-17, come to the airshow and register them for a free flight in a general aviation aircraft flown by a highly experienced pilot. It is an experience your child will never forget! Young Eagles flights will be from 8:30 a.m. – 11:30 a.m., and resume following the airshow from 3:30 p.m. – 5:00 p.m. Registration begins at 8:30 a.m. Flights are limited, so register early! To keep up to date with the show information go here.